The saint’s legend speaks of a king who died a dramatic death in battle outside the church where he had just celebrated mass. But what can modern science tell us about his remains? 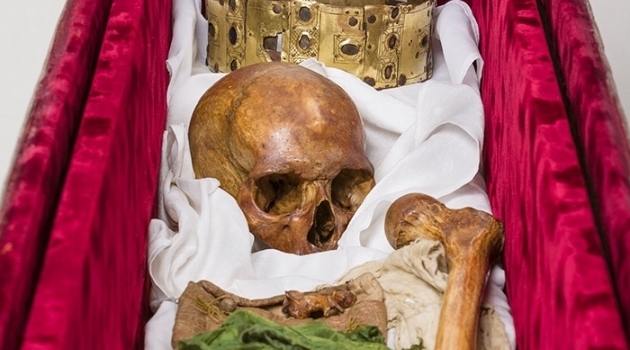 A joint research project headed by Uppsala University now reveals more of the health condition of the medieval king Erik, what he looked like, where he lived and what the circumstances of his death were. No contemporary sources mention Erik Jedvardsson, the Swedish king who was later sainted. The only account of his life is the saint’s legend, in its preserved form written in the 1290’s. Such legends are often unreliable. The Erik legend is, however, based on an older legend which has been lost, and this longer legend may have been much older. The preserved legend says that Erik was chosen to be king, ruled fairly, was a devoted Christian, led a crusade against Finland, and supported the Church. He was killed in 1160, in his tenth year of rule, by a Danish claimant to the throne. His remains have rested in a reliquary since 1257.